The sedan is followed by the two-door model: At the Geneva Motor Show 2010 the BRABUS E V12 Coupe celebrates its world debut as the world's fastest Gran Tourismo. Based on the new Mercedes E-Class coupes, BRABUS builds a luxurious 2+2-seater in small-series production. It is powered by a BRABUS SV12 R Biturbo 800 twelve-cylinder displacement engine that produces 800 hp (788 bhp) / 588 kW of power and a peak torque of 1,420 Nm (1,047 lb-ft). BRABUS (Brabus-Allee, D-46240 Bottrop, phone + 49 / (0) 2041 / 777-0, fax + 49 / (0) 2041 / 777 111, Internet www.brabus.com), accepted by the German Federal Vehicle Registration Agency (Kraftfahrtbundesamt) as an automobile manufacturer, offers this high-performance automobile capable of reaching speeds in excess of 370 km/h (230 mph) starting at 478,000 Euros MSRP. Like the fourth-generation BRABUS E V12 sedan the new E V12 Coupe is powered by a BRABUS SV12 R Biturbo 800 displacement engine. Drawing upon decades of experience in developing and building high-performance vehicles the twelve-cylinder engine was fitted into the engine bay of the two-door E-Class. The basis for this engine is the twelve-cylinder twin-turbo engine from the latest Mercedes 600 models. Displacement of the engine is increased from 5.5 to 6.3 liters (336 to 384 cu. in.) with the help of a special crankshaft, larger cylinder bore and correspondingly larger pistons. Both three-valve cylinder heads are optimized for mixture flow, and fitted with sport camshafts. Underneath the custom-made hood with integrated carbon-fiber RAM airbox is space for a completely newly developed air intake system. This twin-turbo system was designed from the ground up for the new E V12 generation. It includes two custom high-performance headers with integrated turbochargers and four water-to-air intercoolers. The stainless-steel high-performance exhaust system with free-flow metal catalysts was also custom-tailored for the confined space under the E-Class Coupe. In addition, the BRABUS engine specialists have developed a precision engine management system that controls injection, ignition and driving dynamics systems. The result is an optimal combination of impressive power yield and eco-friendly emissions that meet strict EURO IV exhaust limits. The BRABUS SV12 R Biturbo 800 engine is lubricated with high-tech motor oil from technology partner ARAL. It produces a rated power output of 800 hp (788 bhp) / 588 kW at 5,500 rpm. The even more impressive peak torque of 1,420 Nm (1,047 lb-ft), available already at a low 2,100 rpm, is limited electronically to 1,100 Nm (811 lb-ft). Power is transferred to the rear wheels via a reinforced five-speed automatic transmission and a BRABUS high-performance limited-slip differential. The BRABUS E V12 comes standard with state-of-the-art driving stability programs that can be deactivated at the push of a button. Performance of the coupe is as exceptional as that of the four-door model: The BRABUS E V12 Coupe sprints from 0 - 100 km/h (62 mph) in just 3.7 seconds, to 200 km/h (124 mph) in 9.9 seconds, and reaches 300 km/h (186 mph) after a mere 23.9 seconds. For street-legal use the top speed of the Gran Tourismo is limited electronically to 350 km/h (217 mph). Without the limiter the two-door twelve-cylinder car is capable of speeds in excess of 370 km/h (230 mph). This extreme performance also places highest demands on the vehicle's aerodynamic properties. The BRABUS designers went into the wind tunnel to develop a body conversion kit made from high-strength yet especially lightweight carbon fiber. The kit combines sporty design and aerodynamic efficiency to perfection. The BRABUS front was designed to reduce lift on the front axle and to provide all radiators of the V12 with an optimal supply of cooling air. Air outlets in the sides route the air quickly away from the heat exchangers. Another important design feature was to provide the front brakes with cooling air. Integrated LED daytime running lights further increase active safety. A wider track means better directional stability at high speeds. 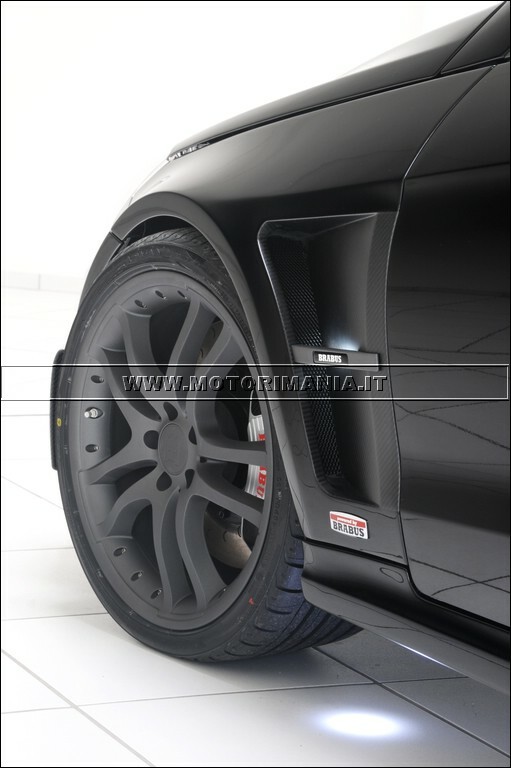 Because of that BRABUS has developed special carbon-fiber sport fenders with integrated air vents for the front axle. Special carbon-fiber rear fenders add 60 millimeters (2.4 in.) to the width of the coupe on the rear axle. 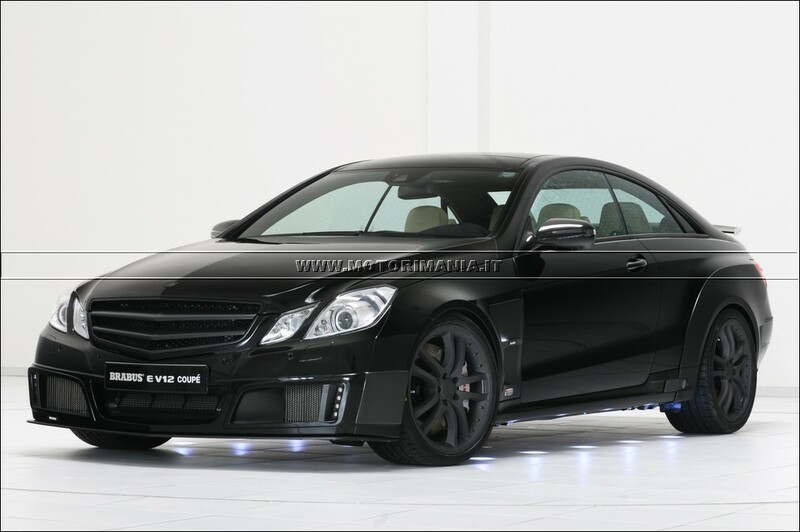 The BRABUS E V12 Coupe runs on especially wide wheels fitted with high-performance tires from Pirelli or YOKOHAMA. The 19-inch combination is perfect for the enormous top speed the car is capable of. The wheels are 9.5 inches and 10 inches wide and customers can choose from BRABUS Monoblock designs VI, E, Q and S. Tires in size 265/30 ZR 19 are mounted on the front axle. Size 285/30 ZR 19 tires on the rear axle provide optimal traction. Rocker panels with integrated illuminated BRABUS logo and LED entrance lights route the air stream along the sides with minimum turbulence. They also lend the two-door car a longer, sleeker appearance. The BRABUS rear apron with carbon-fiber diffuser features a centrally mounted reflector and custom-tailored cutouts on either side for the BRABUS quad sport exhaust system. The BRABUS rear spoiler is essential for well-balanced aerodynamics at high speed. To make the BRABUS E V12 Coupe not only a superior road warrior but upon request also an extremely sporty racer on the track the suspension was completely redesigned. The redesign includes special suspension components on front and rear axle that offer a wider range of individual suspension settings. These measures are complemented by a BRABUS coil-over suspension that features a multitude of selectable settings for bound and rebound. The shock absorbers on the front and rear axle feature ten selectable settings for bound and rebound. The ride height has an adjustment range of 35 millimeters (1.4 inches). Sport sway bars can further minimize body roll during fast cornering. The BRABUS high-performance brake system meets the toughest demands, on the road or on the track. The front axle features 12-piston aluminum fixed calipers and vented and grooved steel brake discs measuring 380 x 37 millimeters (15.0 x 1.5 inches). The rear axle stops on six-piston aluminum fixed calipers gripping discs measuring 360 x 28 millimeters (14.2 x 1.1 inches). The BRABUS high-performance brake system incorporates all functions of the standard Brake Assist system of the Mercedes E-Class. The interior combines sporty character with luxurious ambiance. An ergonomically shaped sport steering wheel is part of the equipment list of the BRABUS E V12 Coupe as are sport seats upholstered with the finest leather. The seats provide excellent seating comfort and lateral support. Genuine carbon-fiber trim on dashboard, center console and doors adds further sporty highlights. 2-door coupe based on the Mercedes-Benz E-Class coupe, model series C 207. Unibody, with BRABUS aluminum front sport fender flares and carbon-fiber rear fender flares steel body widened by 60 millimeters (1.4 inches) on the rear axle. 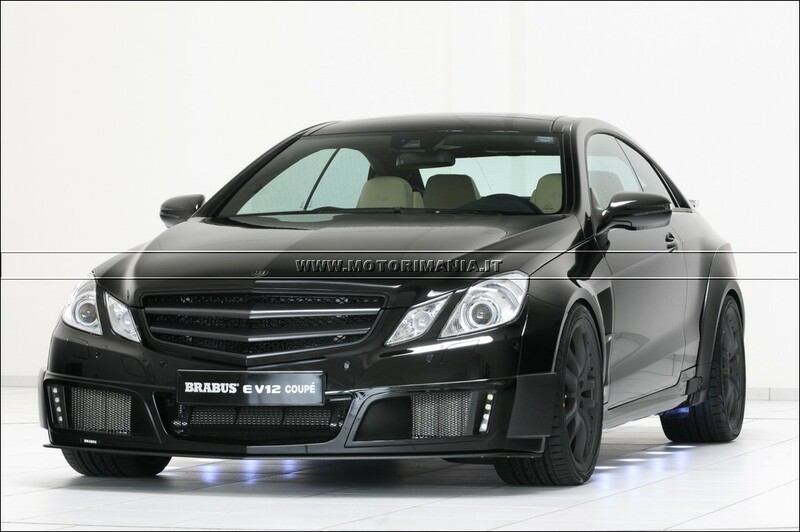 BRABUS E V12 Coupe carbon-fiber aerodynamic-enhancement kit with front apron, rocker panels, rear spoiler and rear diffuser. 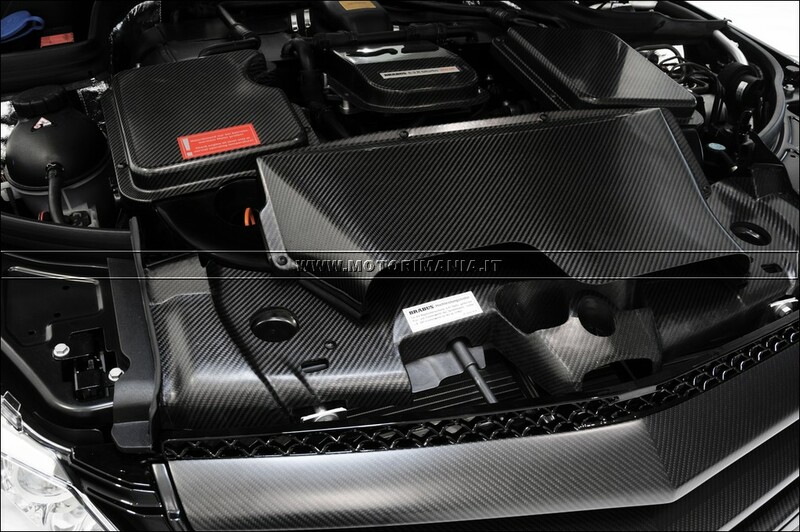 BRABUS hood with integrated RAM airbox. Length	4.698 mm - 184.9 in. Width 1.846 mm - 72.7 in. Height 1.358 mm - 53.5 in. Curb weight 1.850 kg - 4,078 lbs. Gross vehicle weight	2.290 kg - 5,049 lbs. Fuel capacity/reserve	66 l / 8 l - 17.4 gal. / 2.1 gal. BRABUS SV12 R Biturbo 800 displacement engine based on Mercedes 600. Displacement increase to 6.3 liters with special crankshaft with longer stroke and larger cylinder bore and corresponding pistons. Inlet and outlet ports of both cylinder heads optimized for mixture flow including installation of special camshafts. BRABUS SV12 R Biturbo 800 system with two high-performance turbochargers and special exhaust manifolds with integrated turbine housings, four water-to-air intercoolers and special air intake tract. 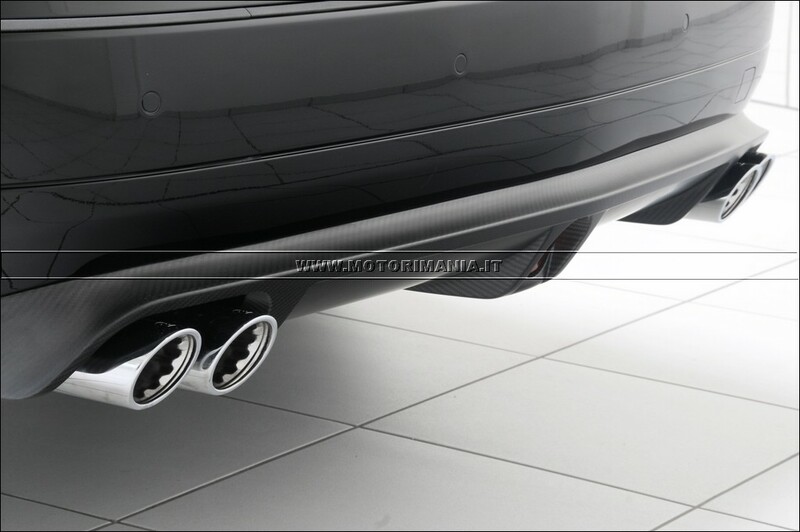 BRABUS stainless-steel high-performance exhaust system with free-flow metal catalysts. Newly programmed mapping for engine electronics and on-board diagnostics. BRABUS limited-slip differential with locking rate of 40 percent Final drive ratio either 2.65 : 1 (V/max 315 km/h / 196 mph) or 2.24 : 1 (V/max more than 370 km/h / 230 mph), electronically limited for use on public roads to 350 km/h / 217 mph). Independent suspension front and back with height-adjustable BRABUS coil-over sport suspension. Three-link axle with custom lower A-arms for individual adjustment of toe-in, camber and caster, anti-dive geometry. Height-adjustable BRABUS struts with coil springs and gas-pressure shocks with ten selectable settings for compression and rebound, BRABUS sport sway bar. Multi-link suspension with custom upper A-arms for individual adjustment of toe-in, camber and caster, anti-squat and anti-dive geometry. Height-adjustable BRABUS struts with coil springs and gas-pressure shocks with ten selectable settings for compression and rebound, BRABUS sport sway bar. BRABUS Monoblock S alloy wheels with YOKOHAMA ADVAN high-performance tires. 0 - 100 km/h (62 mph): 3.7 sec. 0 - 200 km/h (124 mph): 9.9 sec. 0 - 300 km/h (186 mph): 23.9 sec.